Brandon Sanderson is an amazing writer, the kind of writer I want to be 'when I grow up'. Not a one hit wonder with one book or one series or one genre, but he hits every genre and hits every mark. Not a single one of his books or short stories, even the knows in genres I don't particularly like I find Amazing. He's even been chosen (due to his long friendship with and amazing writing skills) to finish Robert Jordon's Wheel of Time series. The Mistborn series is where I first met Sanderson's writing. since then I've read the short stories 'First Born' and 'Legion' (while I have 'The Emperors Soul' ready to read) I've read the stand alone novel 'Elantris' and everything that has been written in his book series, the stormlight Archive and then the Mistborn series, the original trilogy and the detective novel set 300 years later (And I'm super looking forward to the next one but its not out for another year :( ). 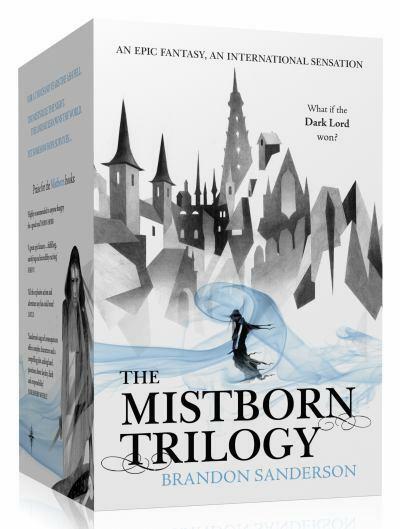 Mistborn is a fantastic concept in a fantastic world. I practically feel like i'm there when I'm reading it. The first book is about a rebellion to take down the empire of gods, but what happens next? in the aftermath of a rebellion, you look at other book series where a rebellion is the point of all the books, and then wonder what happens after? Surely thats not the end of all that turmoil? Just because the Evil king is gone doesn't mean that everythings roses does it? Well Mistborn book two tackles those questions while book three answers the question "if he was emperor for a thousand years then was he doing something right?" The world is a mixture of medieval to early victorian weapons tech with victorian to post industrial tech in all other areas. It's a well built and maintained world that fully commits to it's totally unique power set. The powers revolve around metals. you consume some metal, you have the power within you, you burn it away. each metal does different things and gives the user different powers. Most users only have the ability to use one of these powers but a few can use all of them. There are other power sets, all revolving around metal but talking about them would give away plot elements and You are going to go read it, so I wont tell you them. The characters are fun and realistic, hard and powerful. I'd never met another book that I believed in so thoroughly, and made me so sad that I hadn't been the one to make it. After reading it I had a strange sensation about the powers like 'its so obvious, why hadn't I thought about it? why had nobody else thought of it?' seriously, its amazing. you should read it.